I was sitting in a meeting with my boss and a few other marketing department colleagues at one of my previous jobs. The purpose of our meeting was to talk over our overall strategy—particularly for social media—and identify if there was anything that could be streamlined and simplified. We were a really small department. So, if there was any way we could save ourselves some time and effort, we were all ears. I sat in my swivel chair at the conference room table cringing. I don’t consider myself a social media expert, but I knew enough to immediately ascertain that this was a terrible idea. We had vastly different audiences between the two accounts who would undoubtedly expect different messaging. And, in all honesty, whenever I had seen a business employ this same tactic, I simply thought of them as lazy—which wasn’t exactly the reputation we were aiming for. I’m willing to bet you’ve found yourself in a similar situation at least once or twice before (it’s happened all too often for me—after all, this was the same boss that suggested I dress up as a reindeer for the company holiday reception). Just because someone is your superior doesn’t necessarily mean he or she is constantly brimming with genius suggestions—spoiler alert: bosses have bad ideas too. But, if you know what it’s like to try to bite your tongue as your manager raves on and on about an idea that she thinks is the absolute greatest, then you also know what a sticky situation this can be. Should you speak up? Or, should you nod along enthusiastically in an effort to save yourself some trouble and stay on your boss’ good side? Well, that depends on a lot of things—including the specific idea and your working relationship with your manager. But, in the interest of helping you navigate those murky waters, here are four different strategies you can implement when your boss spits out an eye roll-worthy suggestion. Oftentimes—particularly in meetings that function more like brainstorming sessions—we have the tendency to shout out a half-baked idea before we’ve even had the chance to think through the logistics behind it. We get so swept up in the spirit of innovation and creativity that we’re more than willing to contribute a suggestion completely off the cuff. We’ve all done it—and really, there’s nothing wrong with it. Well, what if that’s exactly what your boss is doing? Remember, in most cases, your supervisor is tossing out an idea to gauge reactions and gather feedback—that doesn’t mean she’s doling out a strict demand with a “my way or the highway” sort of attitude. In these cases, it can be particularly helpful to ask questions about the suggestion and push for more clarification about her specific idea. This will get the wheels turning and force your boss to think about her suggestion with greater context—rather than just in the heat of the moment. More often than not, it’s enough to kill the idea altogether without you ever needing to say anything directly critical about her contribution. Whew—crisis averted. You’ve pushed for some additional details, and you think it’s completely obvious that this idea is destined to be a total flop. Your boss? Well, he might as well be standing at a podium with fireworks shooting off and the American flag waving behind him—with the way he’s talking, you’d think he just came up with the concept for sliced bread. So, now what? It’s time to poke holes in his suggestion—in a polite and professional way, of course. Remember, no matter how off-the-wall his current suggestion, your boss is still a rational human being (well, hopefully) who’s willing to listen to logical arguments. See how pleasant yet straightforward that was? The key is to start with something positive—I’m sure you can find some nugget of goodness within your boss’ pitch. Then, pick one (yes, only one—you don’t want to seem like you’re tearing him apart) major downfall and explain yourself. You’ll make your opinion known, while likely also encouraging a productive discussion. If you know enough to think an idea is terrible, chances are you have a better suggestion up your sleeve. So, why not share it? This works best if your idea can even somewhat stem from what your boss originally suggested. This gives your boss credit and emphasizes that one piece of her idea that was actually solid, while simultaneously making it clear that you think the core of her suggestion needs a little tweaking. Plus, you’re volunteering to put in the legwork to carry your own suggestion to fruition. Let’s face it—people are much more willing to jump on your bandwagon when you’ll be the one doing the majority of the heavy lifting. I think all of the above three strategies can be effective. However, only you can know how your boss might react to constructive criticism based on your past exchanges and interactions. And, there are those rare instances (and, unfortunately, those bosses) who will only fly off the handle at the first sight of opposition. I hate to say it, but in those cases, you’re probably better off zipping your lips—unless your manager’s brilliant new suggestion is enough to cause major detriment to your team or your entire company. In the end, your boss is still your boss. It’s up to you to decide if any potential fallout from disagreeing is worth it to you. If it isn’t? Well, just keep biting your tongue. Awkward is the only word you can use to describe those instances when your boss speaks up with an idea that is nothing short of terrible. You feel an irresistible urge to speak your mind. But, on the flipside of that coin, you don’t want that to lead to a strained relationship or hurt feelings. 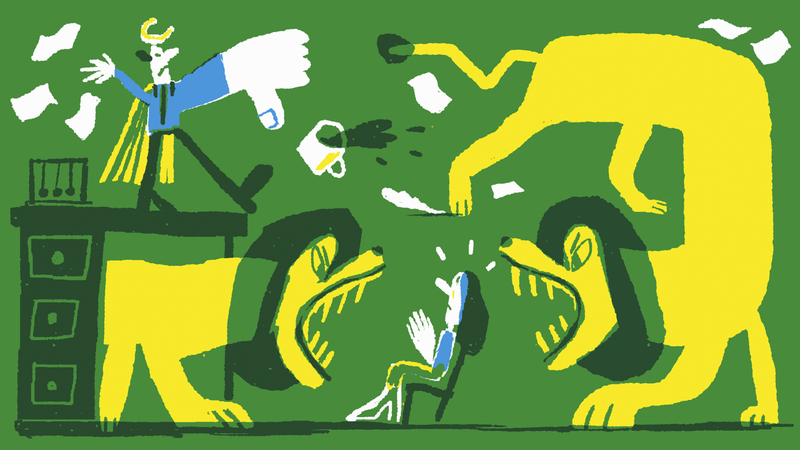 Give one of these strategies a try, and you’re sure to walk away from that conversation with your professional reputation intact—and maybe even a better suggestion on the table! Kat is a Midwest-based freelance writer, covering topics related to careers, self-development, technology, health, and a little bit of everything in between! In addition to writing for The Muse, she’s also the Career Editor for The Everygirl and a contributor all over the web. Say hi on Twitter @kat_boogaard. Image by Nick Shepherd via Getty.